Twisted Hams is a rock 'n' roll band from El Paso, Texas. The band was formed by three local science teachers and has expanded to a four piece group (sometimes five). The current members are Nicole O'Leary, Paul Hyder, Ron Lambert, and Randy Russ. Although the name was originally derived from a sandwich, it is really indicative of the bands quirky music and showy attitude. The band is diverse in its musical influences and plays a wide variety of styles. Mostly, just good ol' feel good rock n' roll with influences from folk rock, rockabilly, jazz, ska, punk and even Zappa. These styles are blended in a smooth and pleasing way that attracts a wide range of listeners. Some of our songs have tongue-in-cheek lyrics that come off as being slightly irreverent. Dennis Woo of KTEP radio described our music as "original classic rock". We recorded our first CD in July of 2012 at El Adobe Studios in El Paso, Texas. 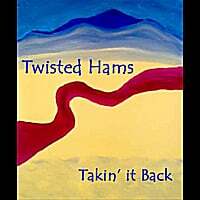 Our second CD, titled "Twisted Hams", recorded at Sweat Shop Studio, was released (Dec. 2015) and is now available on http://CD Baby.com and iTunes. Click on the tabs at the top of the page to see more. Please check out our bios page for more info about each of us. Our latest self titled CD is out! Get yours at http://www.cdbaby.com/cd/twistedhams2 or iTunes/music. See the Twisted Hams music slide show on YouTube now. Just type in Twisted Hams and check out "Please Don't Call".